Author of Yoga Anatomy (one of the most widely recommend anatomy texts for Yoga Teachers and Practitioners in the world), and founder of the Breathing Project. Leslie Kaminoff is a yoga educator inspired by the tradition of T.K.V. Desikachar. He is recognized internationally as a specialist in the fields of yoga, breath anatomy and bodywork. For over four decades he has led workshops and developed specialized education for many leading yoga associations, schools and training programs in America and throughout the world. His approach to teaching combines intellectual rigor, spontaneity and humor, and is always evolving. Leslie is the founder of The Breathing Project, a New York City based educational non-profit dedicated to advancing educational standards for yoga teachers and other movement professionals. His unique year-long course is available online at yogaanatomy.net. You can follow Leslie on Instagram (@leslie.kaminoff), Twitter (@lkaminoff) and on Facebook (LeslieKaminoffYogaAnatomy), on YouTube (YogaAnatomy) and learn more at YogaAnatomy.org. This session features Leslie at his storyteller best – featuring video clips, archival photos, personal class notes, and memories of being a student of T.K.V. Desikachar for three decades. Blending humor, inspiration, and specific practices learned directly from his teacher, Leslie will strive to give students the feeling of what it was like to learn from one of the greatest yoga teachers of the past century. 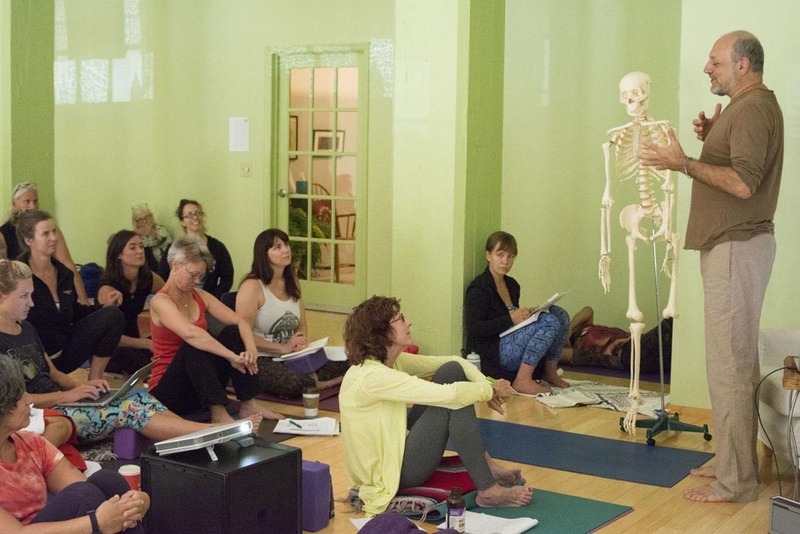 Weekend Package $499 (Earlybird) includes Yoga Anatomy Book!! In honor of his teacher T.K.V. Desikachar, yoga educator Leslie Kaminoff has designed this weekend workshop to explore the practical application of Desikachar’s teaching approach, which honors above all else the relatedness between student and teacher. Drawing from 40 years’ experience in the fields of yoga, movement, bodywork and healing, Leslie will explain and demonstrate how to cue a yoga practice that is both empowered and embodied, and that allow each individual to have a unique experience in a group of any size, from one to a hundred. Learning the simple geometries of classic asana is a great starting point for the physical aspect of yoga practice, just as learning scales on a piano is a necessary foundation to playing music. This is a workshop that tunes into the music of the body, by honoring the spirals, fluids and asymmetries inherent in our organic forms.&nbsp; We will practice in a way that seeks more balance in our systems by honoring the complementary forces of order and chaos, inquiry and technique, form and function. By recognizing the fundamental job of a yoga teacher is to help students re-inhabit their bodies, we can make a few key changes to transform our teaching language into a more empowering experience for our students. Specific classroom strategies that promote better body awareness will be re-imagined and demonstrated for commonly-taught practices. A discussion of long and short term skill-sequencing will also help prioritize teaching choices for students of every level of experience. Increasing the safety and healing potential of a flowing practice can be achieved with simple modifications to breath and alignment technique. And, by evaluating timing in relation to movement and sequencing of spinal articulation. This session will demonstrate, through practice and inquiry, how students in a class of any size can be led deeper into their own unique experience without sacrificing the energetic benefits of group practice. No refunds, however if you change your mind or have a change in circumstance you can transfer your place to another person. In the unlikely event that training is cancelled by organiser you will be entitled to full refund. Your own mat and a cushion to sit on , block and strap and lunch (snacks/drink bottle). There are many cafes near by and plenty of time to have lunch during 90 minute break. Please ensure you arrive on time at least 10 minutes prior to arrival and to be registered by your host – Lee Heron will be signing you in. Please report to Lee and make then settle in to the studio. Leslie will start ON TIME. Please avoid lateness. See times listed in your confirmation and in this listing. Times are also listed on our website post and on facebook.